Effective November 01, 2013, we are discontinuing use of the email addresses, mike@myclearwave.net & wssi@myclearwave.net. See you at the Blade Show, June 3rd â€“ 5th. We will be at booth 707 this year. Mammoth ivory (stabilized by Wood Stabilizing Specialists, Int'l.) 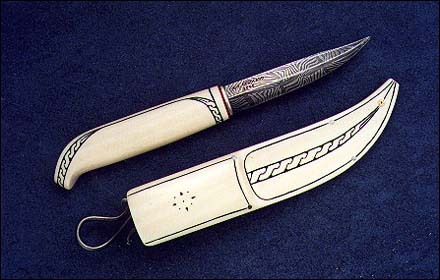 handle & sheath with Damascus blade. Reindeer and caribou antler and black walnut root burl. Blade made from forged out Honda coil spring. 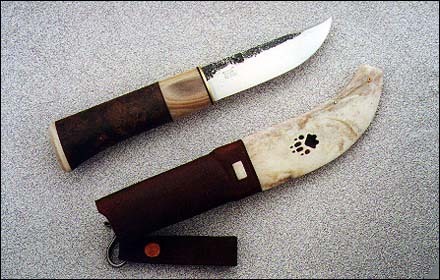 Leather on sheath is reindeer. All organic materials, except the leather, stabilized by Wood Stabilizing Specialists, Int'l. This page was last modified : Monday, 27-Nov-2006 03:52:46 EST.